Update: This blog was written in 2015 for our annual Pink In The Rink Weekend with the Texas Stars. Our 2016 event will take place on Friday, Feb. 26 at 7:30pm and Saturday, Feb. 27 at 7:00pm. Derek Hulak and his team will once again wear special-edition PINK jerseys as they face the Ontario Region both nights and raise money for the Breast Cancer Resource Center! Visit here for more information about the 2016 Pink In The Rink Weekend. In honor of this February’s special two-night event, Texas Stars’s player, Derek Hulak, reflects on his own personal experience with breast cancer, losing his mother to the disease at age seventeen. Below is his story. 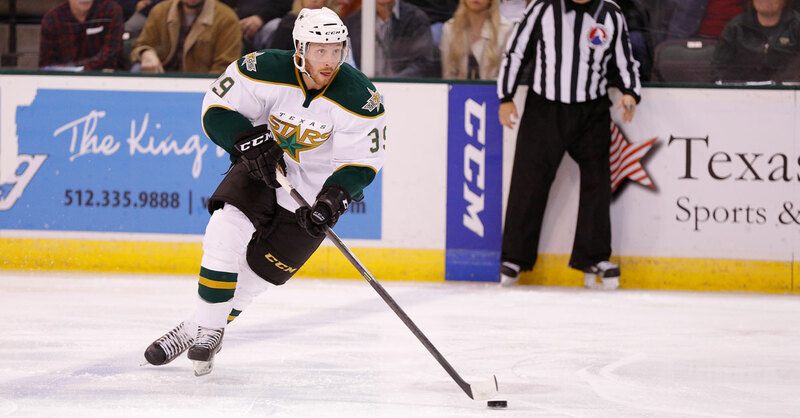 As a professional athlete, Texas Stars left-winger Derek Hulak has had his share of memorable moments – a game-winning goal here, a most-valuable-player nod there. Yet, looking back at a lifetime of achievements, no moment is more reflective of Derek’s unique and inspiring sports journey than his milestone entry into hockey’s elite ranks, scoring on the first shot of his American Hockey League debut. “I kind of had the feeling that I had someone out there watching over me that game,” he recalled. It was poetic happenstance that Derek’s first appearance as a Texas Star happened to align with a date that already held great significance in his life. Derek’s mother, Alina, was diagnosed with breast cancer in 2005 when Derek was just 15 years old and entering his first year of junior hockey. At the time, Derek had been invited to the Regina Pats training camp and was living a two-hour drive from his parents’ home in Saskatoon, Saskatchewan. “She was always worried that her condition was affecting how I played on the ice, so for the first few months she kept it a secret,” Derek said. He would eventually be cut from the Pats roster and returned to his hometown to play another year of midget hockey before transitioning to the region’s junior ranks. Derek returned to the Pats the following season, this time earning a full-time roster spot. He remained with the organization through the holiday break, at which time he and his family petitioned Regina to trade him to their rival club in Saskatoon so that he could be closer to Alina. “We made a family decision that I was going to ask for the trade and hope that they accommodate me. If not, the idea was thrown around of just taking the rest of the year off hockey or coming back and playing another year of midgets – just whatever it took to be able to be around her during that time.” Derek said. Derek took advantage of every extra moment he had with his mother. “Before [home games] it was my routine to go for pregame skate, [then] go have a bite to eat at the hospital and spend the day with her before I went to the rink. Alina passed away on March 27, 2007, after a two-year battle with the disease. Derek remained in Saskatoon near family for the next seven years, playing in Canada’s Western Hockey League, then joining the University of Saskatchewan Huskies men’s ice hockey team. He was named the nation’s University Cup most valuable player in 2014 before joining the Texas Stars – the top developmental affiliate for the National Hockey League’s Dallas Stars – last spring, and helping the club to capture its first Calder Cup as American Hockey League champions this past June. In August, Derek was given a celebratory day with the Cup which he spent in Saskatoon, surrounded by friends and family. “As soon as I found out I was going to get it, I knew there was one spot I was going to take it for sure, and that was my Mom’s grave,” Derek said. “It was definitely an emotional day bringing the Calder Cup to her grave, but it was something that I knew I really wanted to do, and I was glad I did. “In my opinion, there’s no chance I would be where I am today without her and without what she did for me over the years and the support she gave me. Derek found inspiration in his mother’s resilience and positive outlook. “I knew what she was battling. Seeing her at the hospital and some of the things she went through really put things in perspective for me. That perspective gave me a little more drive, a little more motivation that if she’s going through this, I can push harder in this game. I can push harder for her after all she’s done and all she’s sacrificed for me. “When she passed away, [it] turned into a little bit more of a memento, but it still carries the same idea behind it. That’s something I’ll do for the rest of my career,” he pledged. As a professional hockey player, Derek understands that he has a unique platform from which he is able to bring attention to this special and personal cause. In late January, he petitioned the league to allow him to wear a “Marty’s Men” patch in support of Cody Smuk (nicknamed “Marty”) – a former childhood and college teammate who is in his own fight against cancer – on the back of his helmet in the Stars’ January 31 matchup with the Charlotte Checkers. Derek had two goals in the contest to lead Texas scorers. “He’s one of those guys. He doesn’t want people feeling sorry for him. He’s such a strong guy. He knows what he’s going through, and he handles it every day. He’s really an inspiration,” Derek explained of Smuk. He acknowledged that his personal experiences have made the league’s united front against the disease even more special. “When teams do Pink in the Rink nights, they’re a bit of an emotional night for me.” Derek explained.